END PERSECUTION OF AMADIBA CRISIS COMMITTEE! At a supposed ‘public hearing’ convened by South Africa’s Minister of Mines Gwede Mantashe on Monday 24th September, police used teargas and brute force to exclude local residents affiliated with their grassroots organisation, the Amadiba Crisis Committee (ACC). The police then arrested the community’s lawyer Richard Spoor protesting against this exclusion. The meeting was ostensibly to consider whether titanium mining should go ahead on Xolobeni sands. Ever since the Amadiba Crisis Committee made known their opposition to the project, they have been persecuted. ACC chairperson Bazooka Radebe was shot dead in 2016, other leaders now fear for their lives. Amadiba Crisis Committee (ACC) was formed in 2007 by villagers of Xolobeni in Pondoland to fight mining titanium in their area. The Xolobeni village is situated in the Wild Coast in the Eastern Cape. The ACC have a plan to develop their beautiful region, also known as the Wild Coast, through agriculture and ecotourism. 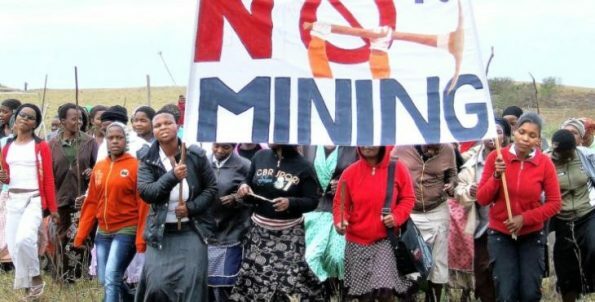 The group has taken the Ministry of Mines to court, to insist that the community’s wish not to have the mine is fully taken into account. The proposed Xolobeni mine is a project by Transworld, a wholly owned subsidiary of Australian corporation Mineral Commodities (MRC), and would be one of the largest titanium mines in South Africa. An estimated 40 percent of its shareholdings by London financier Graham Edwards. MRC already runs a coastal mine on the west side of South Africa, which has caused widespread environmental damage. The Xolobeni project is now fronted by a local company, but MRC and Edwards would still be the ultimate beneficiaries. After the massacre of 34 striking mine workers in 2012 in Marikana, South Africa, we call for an end to the toxic collusion between London financed big business, the South African ruling ANC government and the South African police. Take urgent action against the criminalisation of a community fighting for a sustainable future.